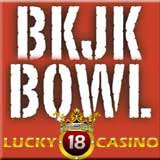 As the NFL football season builds momentum in the weeks before the Super Bowl and college bowls, the BKJK BOWL II online blackjack tournament at US-friendly Lucky18Casino.com is also heating up as the $21,000 final in January approaches. Online blackjack players can win their way to Sunday night Weekly Bowls where $1121 and 5 seats in the Monthly Bowl are awarded. The Monthly Bowl’s minimum is $2121 but, depending on how many players buy-in, the purse can grow to $5000 or more. The top 5 players in each Monthly Bowl advance to the BKJK BOWL II final tournament on January 28th. The winner that night will walk away $21,000 richer.